Our range of products include polysurlyn moisture barrier coil, polysurlyn laminated aluminum coil, poly surlyn laminated aluminum coil, poly surlyn moisture barrier coil, polykraft laminated aluminum coil and stucco embossed aluminium coil. Swabs Tapes India Pvt. Ltd. recommends a 3 mil heat laminated Polysurlyn Moisture Barrier Coil, instead of Polykraft for all metal jacketing sheets and rolls. 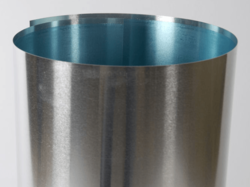 Simple, low cost, and effective resistance to metal jacket and pipe corrosion. 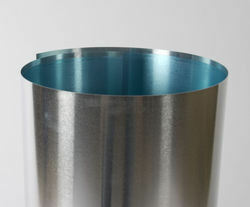 Provides a barrier to crevice or pitting corrosion on the inner jacket surface in cold and hot pipe/tank applications. 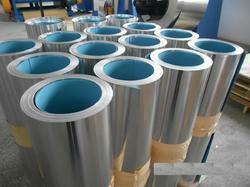 Provides a barrier to galvanic corrosion of jacket or pipe in hot applications. When water is present and touching the metal jacket, corrosion can and does occur. This can happen in all applications (hot, cold, rooftop, industrial, commericial, etc.) and with all insulation types. 1 mil high-density polyethylene, 1 mil Surlyn, and 1 mil low-density polyethylene, with each layer carefully selected to yieldoptimum performance. This multilayer film is laminated to the interior side of STIPL's aluminium and stainless steel jacketing using precise pressure and heat. Use of 3 mil thick three layer Polysurlyn Moisture Barrier, (PSMB) film avoids the pinholes prevent in standard 1 mil single layer Polykraft. In 2005, after careful analysis, STIPL changed from Polykraft to PSMB due to the superior performance and water resistance of the multilayer Polysurlyn film. 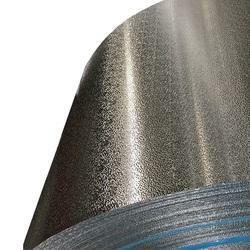 We are one of the well-known manufacturers and suppliers of Polysurlyn Laminated Aluminum Coil The offered Poly Surlyn are cylindrical rolls of aluminium laminated with poly surlyn. Our supplied Poly Surlyn are very large in length, to facilitate the cutting based on client specified dimensions. Our supplied Poly Surlyn are widely used in power plants, petro chemical refinery and cement industries. Swabs Tapes India Pvt. Ltd. recommends a 3 mil heat laminated Poly Surlyn Moisture Barrier Coil, instead of Polykraft for all metal jacketing sheets and rolls. We are one of the well-known manufacturers and suppliers of Poly Surlyn Laminated Aluminum Coil The offered Poly Surlyn are cylindrical rolls of aluminium laminated with poly surlyn. Our supplied Poly Surlyn are very large in length, to facilitate the cutting based on client specified dimensions. Our supplied Poly Surlyn are widely used in power plants, petro chemical refinery and cement industries. Swabs Tapes Pvt ltd is a well-known manufacturer of Polykraft laminated aluminum coil for insulation jacketing & cladding and many other application, coil is available as per customized requirement. Stucco sheet has many uses across a number of industries. It is used in education, manufacturing, medical and more. 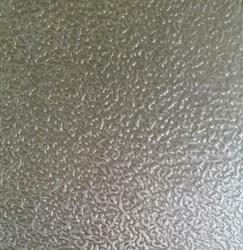 Stucco embossed sheet is more durable than plain sheet of similar charactiristics. Stucco embossing also reduces the light-reflecting ability of the metal. This is due to the pebble-like surface, which is imprinted once the aluminium has been given the required finish. Finally, a stucco embossed aluminum sheet always looks more presentable. We are one of the prominent manufacturers, suppliers and exporters of a wide range of Polysurlyn Laminated Stainless Steel Coil The Coils offered by us are manufactured using high-grade raw material, which is procured from the well-known vendors of the market. 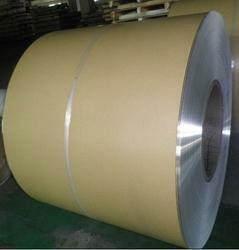 We also test these films on various parameters so as to ensure their durability and superior quality. It contains one high-density layer of polythylene, one layer of Surlyn resin, and one layer of low-density polyethylene.